What is a parallel coordinates chart? Parallel coordinates is a visualization technique used to plot individual data elements across many dimensions. Each of the dimensions corresponds to a vertical axis and each data element is displayed as a series of connected points along the dimensions/axes. 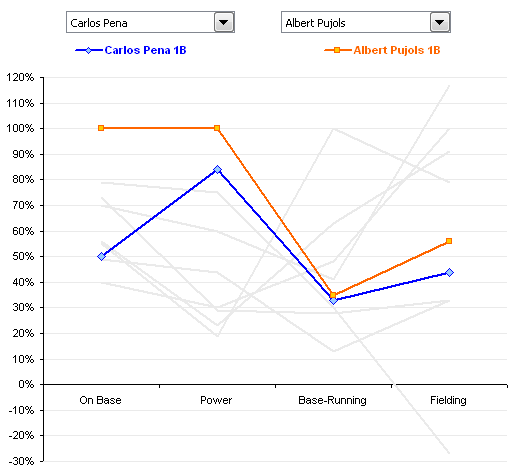 Jon Peltier’s chart of baseball players below offers a simple example. 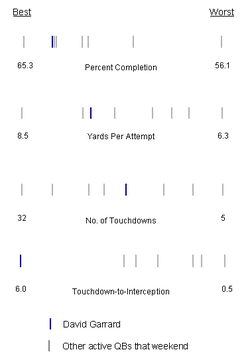 Each line corresponds to a player with performance plotted across four characteristics. Two players have been highlighted to compared values. The first time that I saw a parallel coordinates visualization, I almost laughed out loud. My initial impression was "How absurd!" I couldn’t imagine how anyone could make sense of the dense clutter caused by hundreds of overlapping lines. This certainly isn’t a chart that you would present to the board of directors or place on your Web site for the general public. In fact, the strength of parallel coordinates isn’t in their ability to communicate some truth in the data to others, but rather in their ability to bring meaningful multivariate patterns and comparisons to light when used interactively for analysis. Mr. Few’s final point is right on: with the application of interactive highlighting, filtering, and roll-over detail, parallel coordinate charts can reveal interesting stories in your data. And now you’ve pretty much made an indecipherable graphic. That’s where parallel coordinates can help in showing many dimensions, limited only by horizontal space. Like all good visualizations, parallel coordinates can also show both the forest and the tree. The big picture can be seen in the patterns of lines; individual lines can be highlighted to see detailed performance of specific data elements. What to watch out for when using parallel coordinates? 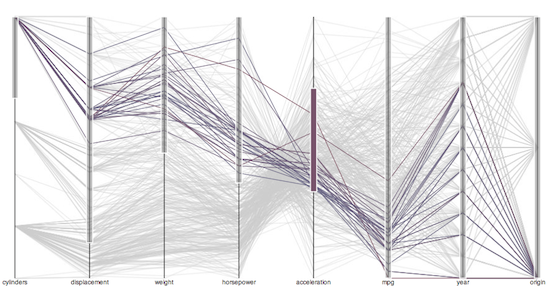 Large data sets create a lot of visual clutter. More from S. Few: "Most of us who have used parallel coordinates to explore and analyze multivariate data would agree that meaningful patterns can be obscured in a clutter of lines, especially with large data sets." The order of the axes impacts how the reader understands the data. Relationships between adjacent dimensions are easier to perceive than between non-adjacent dimensions. As the axes get closer to each other it becomes more difficult to perceive structure or clusters. Depending on the data, each axis can have a different scale, which is difficult to display and for the reader to absorb. Lines may be mistaken for trends or change in values even thought they are only used to show the connected relationship of points. Protovis: In this example, hundreds of cars can be quickly compared by filtering along any dimension. Click and drag along the red rule for a given dimension to update the filter. Advisor Solutions’s Parabox solution goes beyond the parallel coordinate lines to also show information about the distribution of values by dimension. Jon Peltier comes through again with a fine Excel tutorial. "GGobi is an open source visualization program for exploring high-dimensional data"
"FluxViz is a simple cross-platform tool that uses parallel coordinates for the visualization of high-dimensional spaces"
Newer PostMemorable or Actionable or Both.